Well, we had again a full house, a very nice location and great sessions. You can view some great pictures form the event in the MoMoTLV June 2009 event gallery, and you can find the events' PPTs in MoMoTLV's slideshare. It's been great year for MoMoTLV, we held 10 event in 10 different topics, where we brought you around 40 speakers from Israel and abroad. Our community has grown in a single year to 800 members and still growing up every month. We also made an international impact when fring, the Israeli startup we sent to the Mobile Peer Awards in Barcelona competed with 40+ startups from all over the world and won the community award, definitely an impressive achievement! Thanks again for our annual sponsors Orange and Amdocs for supporting our events all throughout this year - we couldn't do it without you! Also thanks goes to the special event sponsor NAVTEQ Network for Developers, for their support of the Israeli mobile community. We remind you that if you have an innovative location application you can still register to the ESNC competition and perhaps win the NAVTEQ special prize. See you at the next events for the second year of MoMoTLV! 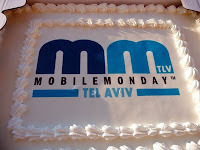 We are glad to announce our June 2009 event, which is our 10th event and marks 1 year since MoMoTLV was founded! The event will focus this time on Location Based Services, a steaming hot topic, and will feature a very special guest from abroad - Michael Moore from Navteq with some good news for developers. So join us for drinks and session at the "Tel Aviva" pub. Registration is done via the MoMoTLV June 2009 event page in Facebook. If you are not already a member of MoMoTLV Facebook Group, please make sure you join that first. If you don't have a facebook account, either get one or ask to get registered using this form (If you register not through facebook, you must receive an approval before being actually registered). Parking info: There's plenty of free parking in the Reading parking lot, which is in a walking distance to the venue. In addition to our annual sponsors Partner Communications (Orange Israel) and Amdocs, the event is also sponsored by Navteq Network for Developers.